One of the key safety instructions we all hear every time we board an airplane is that in the event of cabin depressurization we must put our own oxygen mask on first before helping others. This is vital since no matter how much we care about the family or friends sitting with us, we cannot help them if we ourselves are unconscious due to asphyxia. When it comes to our societal need to transform our schools, we are very much in a similar situation as a depressurizing airplane. As much as we say we want to focus on the needs of students, we will not see the transformations they need in our education system until teachers and administrators are moved to understand the need for change and prioritize the professional learning necessary to get us there. So this week I focused on the ISTE Standards for Teachers , 15 Characteristics of a 21st-Century Teacher, and The 21st Century Workplace which provide clear targets for teachers to consider when teaching the habits of mind, cognitive skills and collaborative abilities students will need in the world we’re preparing them to enter. Consider the verbs of the 5 top level ISTE Standards for Teachers: facilitate, inspire, design, develop, model, promote, engage. In addition to these top level verbs, it is striking that “model” appears nine times across all 5 standards and 20 sub-clusters. When considered in combination with the other verbs inspire and facilitate, I’m struck by the heavy lift the ISTE standards are pointing towards. They suggest that what we need is nothing short of a sea change in school cultures with regard to 21C technology and methodologies. When so many schools outright ban cell phones and so many teachers don’t incorporate technology in meaningful ways, how are they to facilitate, model and inspire? In research for a previous literature review I found that a critical component for implementing the necessary change ISTE calls for comes only with consistent, focused professional learning for teachers. Not only that, but school culture also has a significant impact on the success or failure of information and communication technology (ICT) implementation, much of which is determined by the level of support projected by the principal. School culture can positively impact ICT practices. Positive peer pressure can motivate reluctant teachers to try new approaches with technology. Studies have also found that teachers who see positive student outcomes as a direct result of ICT practices are more likely to continue and expand their ICT toolkit. In a study of three schools where teachers adapted ICT in meaningful ways, all three schools had six characteristics in common: 1) They were well equipped for ICT. 2) Their focus was on changing the process of learning using ICT. 3) Skills were acquired as part of the process of using those skills purposefully. 4) The school provided support. 5) Teachers had opportunities to discuss, reflect and troubleshoot with peers and facilitators over time. 6) The nature of student learning changed along with teachers’ beliefs and knowledge sets (Ertmer & Ottenbreit-Leftwich, 2010). Therefore, the school community must recognize that the most effective professional development is that which facilitates teachers understanding about how specific instructional practices themselves support student learning of particular content. That is, schools must allow teachers to see that technology-supported, student-centered practices impact student acquisition of knowledge (Ertmer & Ottenbreit-Leftwich, 2010). Finally, even when teachers are willing to wrestle with their beliefs, identify what they truly value, use these realizations to motivate changes to their practice via meaningful PD, the role of the principal administrator cannot be underestimated…. The principal plays an outsized role in creating and maintaining at least four of Ertmer & Ottenbreit-Leftwich’s six conditions and is generally responsible for shepherding the wider culture of the school community. Determining what professional learning is necessary among which teachers; establishing the systems for implementing the professional learning plan; creating calendars for structured and unstructured learning; countering programmed time with protected, unprogrammed time for reflection and metacognition about instruction – all these necessities flow from the principal’s office. When the principal does these things in a way that sets high expectations and supports for ICT instruction, shifts can be made more readily if still not easily. However, when the principal’s own beliefs, values, and motivations do not prioritize ICT methods, digitally infused learning environments are far less likely to take hold, even with willing and capable teachers. This dovetails with the what I’ve written about in previous blog posts about the anxiety teachers feel when they are thrust into areas where they do not feel expert. 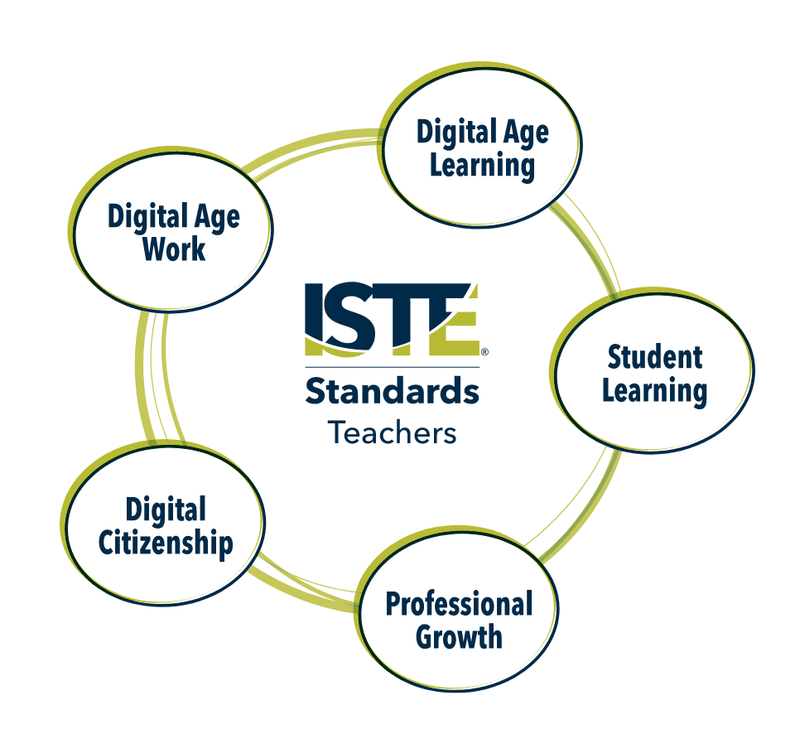 Given the significant shift and stretch for which the ISTE standards are calling, we don’t seem likely to meet them without acknowledging both the fundamental changes in school culture that are necessary as well as high quality and consistent PD for teachers. Additionally, educators must reconcile their reluctance to implement ICT methods in school with their own ICT use in the various aspects of their lives outside of school. When we consider the 21st century world — that is the one we are living in today — and the workplace students will enter, especially as described by Daniel Pink, the need for a cultural and instructional transformation of our schools could not be more apparent. The leap from an “Information Age” to a “Conceptual Age” cannot happen without students learning through active learning and metacognitive methods. ICT and the 4C’s are uniquely suited for the attainment of the skills categories that will be most valued as described by Levy and Murnane: “expert thinking — solving new problems for which there are no routine answers” and “complex communication — persuading, explaining, and in other ways conveying a particular interpretation of information”. To make such shifts, however, educators must blow up the linearity of the industrial model that defines our school structures and curriculum and the information model on which accountability is based in favor of more distributed, differentiated, student-centric proficiency-based approaches that digital and mobile technologies can now facilitate. What ISTE is essentially calling for is SAMRizing and TPACKing our entire education system. We must prioritize changes in school culture through consistent professional learning for teachers around ICT methodologies. Administrators must lead the way, advocating and requiring ICT methods and solidifying the cultural shifts that come as a result. Over the last eleven weeks, this course has provided a remarkable set of resources for incorporating ICT strategies for both classroom instruction and professional learning. In doing so it has facilitated multiple opportunities for reflection about my own practice, where we are as a profession, and how far we all have to go. It has been an excellent next step on this master’s journey! These last two entries are now officially out of my experience when we’re talking about the ICT/digital domains. So I’ll have to resort to some metacognition about collaborative learning and “maker” activities that are a bit more traditional. While I was teaching, I had the good fortune of being a part of Chicago Arts Partnerships in Education (CAPE). In this program, community artists partner with classroom teachers to co-teach academic content through the artist’s particular medium. Three things make this program lightyears ahead of the rest. First, the art is not an “extra” or “add-on”. The artform and its particular methods are used as ways of learning the content. Second, the artist is not a mere guest who comes to visit once a week. The artist is a co-teacher in the classroom of the artistic content and to a lesser extent, the academic content. Third, the teacher and artist commit to establishing a long-term relationship — one meant to last years, not just for the length of a unit. By the end of a CAPE unit, students understand the academic content more deeply from processing it through making the art, and they know how to “do” that artform. The teacher knows new methods for incorporating different kinds of art to teach content, and the artist knows more about the academic content that was taught. Over the years I learned how to create murals and create found-object installations by working with local muralist and painter, Bernard Williams, as well as how to produce shadow puppetry by working with two artists from Red Moon Theater. For any CAPE partnership, the process is the same. When beginning, the teacher meets with CAPE staff and discusses the content they’re interested in teaching and through which medium. CAPE then sets up an appropriate partnership with a local artist. The artist partner and teacher attend a certain number of professional learning sessions about how CAPE works, why it works, and the organization’s expectations for the partnership. Then there is protected time for the teacher and artist to meet and start planning. After these professional learning sessions, it is up to the artist and teacher to set regular planning times to develop the co-instructional unit and individual lessons. The first few “CAPE days” (which usually become “Bernard days” or “Sarah days”), the artist comes to teach the some of the necessary artistic concepts and skills students will need. After that the artistic application moves rendering the academic content artistically. Finally, an installation or performance is also required to take the learning and art public — beyond the classroom itself. CAPE staff continue to support both artist and teacher throughout the process. My CAPE experiences were, hands-down, some of the most powerful teaching and learning experiences I’ve ever had. And the most memorable. To start with, the relationships I forged with the artists I taught with and learned from were foundational to the units we taught together. All the art we created — murals, installations, shadow puppetry — all seemed overwhelmingly difficult to me when we started. But my confidence grew as my relationship with the artists deepened over time. Mutual respect developed between us as we came to know the depth of each others’ expertise. Trust developed. Friendships formed. Plans were made. Over the course of that process, I can confidently say, that while I would prefer to work with an artist co-teacher, if I can’t, I could incorporate any of these kinds of artistic projects into my curriculum and execute them successfully on my own. CAPE artists are working artists, not educators. So starting with a new artist was like having a student teacher in the classroom for a while until they got the flow of unit & lesson planning, structuring the classroom for the lesson at hand and managing the kiddies when they’re up to their eyeballs in paint and cardboard and canvas. Or shifting them from the “fun” of making a puppet to the “work” of writing a script for the show. At the same time, it was fulfilling to see my partner artist develop as educators teaching the techniques and theories of their art. So too with their developing their own understanding of the academic content the art was meant to evoke. As a teacher who relies heavily on formative assessment, it was fascinating to watch and listen for the levels of understanding develop in both the students and the artists as we worked. The same was true for me to learn the art right alongside our students. It’s difficult to describe how exciting it was to hear kids discussing and debating the content as they manipulated the artistic media; and as they manipulated the media, their manipulation of their understanding of the academic content. It’s equally difficult to find prouder moments as a teacher as when my students performed, installed or presented their artwork and then took questions from the audience about the content the art represented. What could leave a stronger imprint on them than not only for others to see them as the experts in the room, but for them to see themselves that way too? I’m certain I was aware of it at the time, but it bears articulating here. As I look back at these experiences, everyone in the classroom inhabited all roles at various points of time over the course of the unit: teacher, learner, novice, practitioner, expert. We were all in it together. Each and every one of us was learning something new. That made for a more equitable distribution among all members of the power dynamics that develop in a classroom. To a very real extent, we were all learners learning together, supporting one another in a spirit of discovery and aiming towards a common goal. No one wanted to leave class on a “CAPE day”.